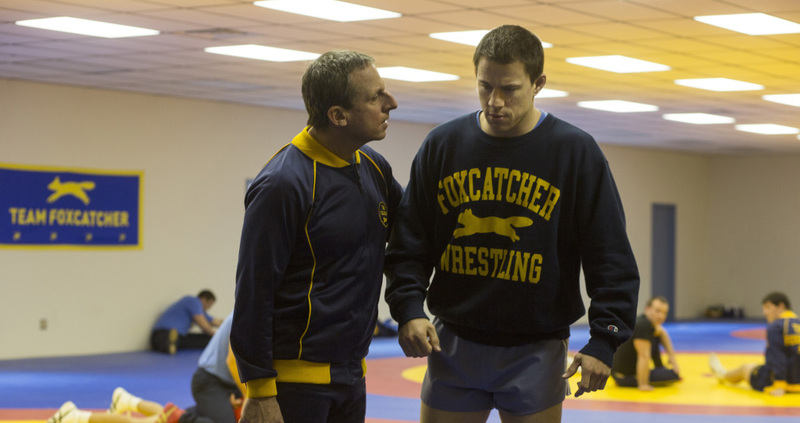 Foxcatcher review by Teejay McFly. PLOT: Based on a true story, Foxcatcher examines the strange relationship between wealthy DuPont scion John Du Pont and Olympic gold medalists Mark and Dave Schultz, whom Du Pont agreed to fund and house as they trained for the 1996 summer Olympics. Review: Foxcatcher was a movie i heard about around the 2014 TIFF(Toronto International Film Festival). Everyone was talking about how great Steve Carell, Channing Tatum, and Mark Ruffalo’s performances were. After finally seeing the movie, i now understand all the praise. I’m sure mostly everyone is talking about Steve Carell’s transformation into John Du Pont, but Channing Tatum and Mark Rufflalo also bring their A-game into turning this horrific true story into an excellent film. The film starts off with Mark Schultz(Channing Tatum) giving a speech to kids about being an American and winning his gold medal at the Olympics from 3 years prior. You kind of get the sense that Schultz doesn’t really know what to do with his life other than train for professional wrestling. He is even seen eating ramen noodles in his kitchen all by himself. Mark then goes to train and work on his mat skills at a gym with his brother(also an Olympic gold medal winner) David Schultz(Mark Ruffalo). You see the two practice grapples and takedowns together – which even leads to David getting a bloody nose. You get the feeling that something is troubling Mark on the inside. Days go by until Mark’s phone rings with an unkown man telling him that John Du Pont wants Mark to visit him at his home estate in Pennsylvania. Just like Mark at the time of the movie, i had no idea who the real John Du Pont was. Thankfully when Mark gets to the Du Pont estate, i learn with the character who John really is. We also learn that Du Pont is a huge fan of Schultz and his older brother and wants to start a wrestling team, team “Foxcatcher”, led by the two brothers. Du Pont’s main goal is to win championships and Olympic gold medals. It’s crazy how the summary of the movie does not even give you the intention that this film ends in a horrific way. While watching the movie, you do get the dark, foggy vibe of it. Steve Carell plays the twisted and dark multi-millionaire John Du Pont. In what could be his best(and especially most serious) role to date. It’s no wonder that he was nominated for Best Actor at this years Golden Globes AND Academy Awards. Most people love to talk about the make-up of Carell and yes, it is a little bit hard to get used to. But once i looked past the fake nose, it was easier to pay attention to the actual story. Not only is this Carell’s best role to date, i would say it’s also Channing Tatum’s. We don’t get the “funny Tatum” from the 21 Jump Street franchise, or even the “action star Tatum” like the G.I. Joe franchise. Here we get to see Channing’s range as an actor and really develop into one of Hollywood’s leading actors. It’s as if each movie he does, he gets better. Crazy to believe that he started out in Step Up. Tatum wasn’t nominated for an Oscar, but his co-star Mark Ruffalo was. Ruffalo is one of those actors that you can always depend on that you will get a great performance from. Whether it’s in The Kids Are Alright or The Avengers, he always does a great job. In Foxcatcher, we see him play David Schultz as a beloved family man and also as Mark’s mentor. It’s kind of like he is the only “pure” character in this movie. Either way, all 3 actors really brought it in this film and it’s great to see it play on screen. 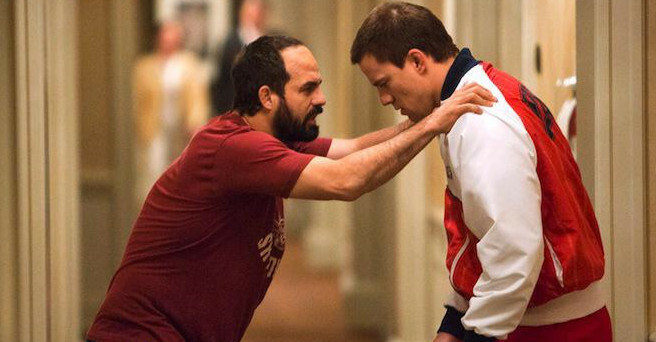 Foxcatcher is one of those movies that maybe not everyone knows about, but once you see it, you will never forget it. I went into this film not knowing anything about the real tragic story. I for sure Google’d about it after watching, as im sure most of you will. I wouldn’t call this the best movie of 2014, but i would put it in the top 5. I give Foxcatcher a 9/10. ← New Avengers: Age of Ultron trailer!